There was a lot to check out since the machine is 75% new, according to DARPA, the U.S. Department of Defense research agency sponsoring the challenge. Only the feet and lower legs of the robot that the teams used in the last phase of the three-part challenge remain in what's been dubbed Atlas Unplugged. "The new Atlas is 75% new," said Gill Pratt, a DARPA program manager. "Only 25% of the parts in there are from the old Atlas. The rest of them are really for the onboard energy storage, better energy efficiency, much more dexterity -- and the robot is much quieter than before. It also is a little bit stronger, so it can better get off the ground in case it falls." The research teams in the finals -- including groups from Worcester Polytechnic Institute (WPI), MIT and Virginia Tech -- had to say good-bye to their Atlas robots late last year. Boston Dynamics took them back to remake them; the teams now expect to get their new machines on Thursday or Friday. Boston Dynamics, now owned by Google, made the robot stronger, more agile, able to carry its own power source, run with a new adjustable hydraulic pump and move without a safety tether or communications cable. The robot, which now weighs 345 pounds, also has newly positioned arms. Unlike the previous version, which had human-like shoulders, the arms on Atlas Unplugged come out from lower on the torso, giving the arms more strength and dexterity. "The arms look more like the Lost in Space robot where the arms come from the middle of the body," said Matt DeDonato, the technical project manager on the WPI team. "That should give us a little more strength for pushing up off the ground. It should be able to do a push-up and give us more reachability and maneuverability inside our work area." While the research teams have been waiting to get their new robots, Boston Dynamics let them get a sneak peak last week at a warehouse in Waltham, Mass. DeDonato, who spent most of last week checking out and working with the new Atlas, said the team members were able to get their software up and running. That's a critical step since there are so many new, moving parts on Atlas Unplugged. Adapting the software they had been using to get the old version of Atlas to walk, climb stairs, open doors and even drive a car to now work on the new robot was a challenge. "We had a couple of hours every day to work on it and we got things working and it walking the first day with a few tweaks," said DeDonato. "The first time you see it, it's a big shock. It looks different and it's very quiet. It's almost an eerie feeling not having that old hydraulic pump making that loud, whiney sound.... It's a great upgrade. Everything looks better." 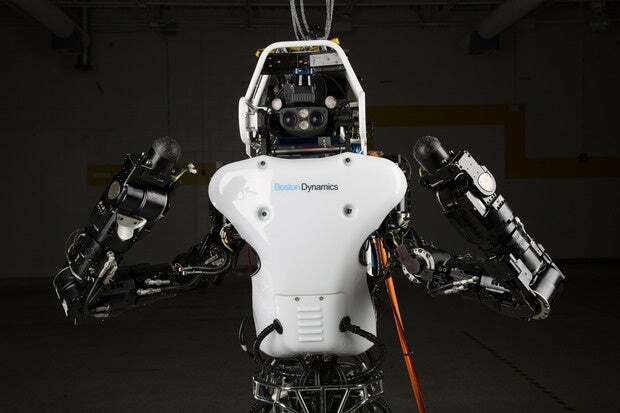 With the final competition coming up June 5-6, all of the teams using Atlas Unplugged will have a lot of work to do to adapt to their new machine, Joe Bondaryk, project manager with Boston Dynamics, noted in a video. The challenge was developed to entice researchers to develop robots that could be used in the aftermath of natural or man-made disasters, like earthquakes or bombings. It's hoped that one day, robots will be able to drive up to damaged buildings, walk in, maneuver through various rooms, turn off valves and find survivors. The finals will test that scenario. According to DARPA, each team's robot will need to either drive or walk to a mock disaster scene where it will have to work through a series of tasks, like using a drill, climbing over rubble or up stairs, carrying a fire hose and opening doors. "The finals are going to be very hard," said Pratt. "They're going to be much harder than the trials were. It's what we have to do to really bring these systems to the right level of development. We want the tests to be much more authentic, much more like real disasters.... The robots will have to perform much, much better than before." In the DARPA video above, officials talk about the changes that have been made to the Atlas robot that will be largely used in the finals of the Robotics Challenge this coming June.